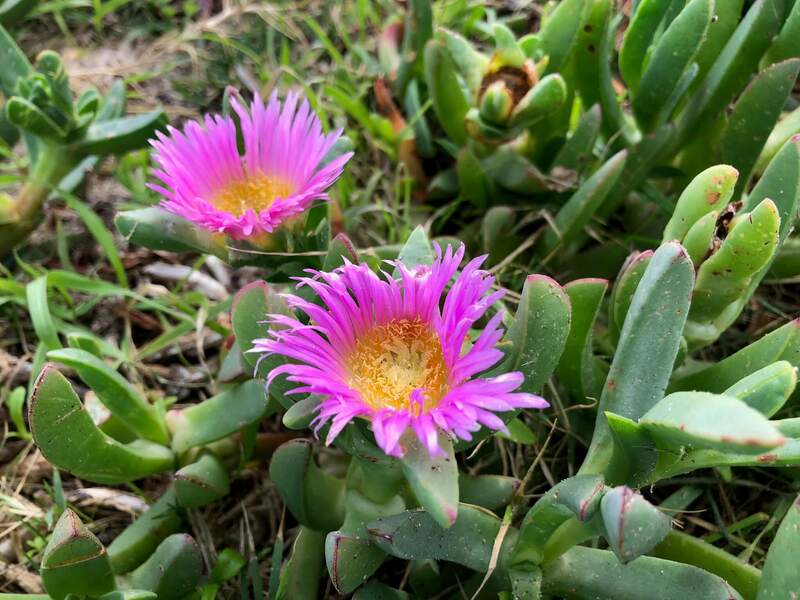 Early colonial references to Mesembryanthemum or ‘Hottentot fig’ – named after its South African counterpart – suggest native as well as naturalised species of Carpobrotus. 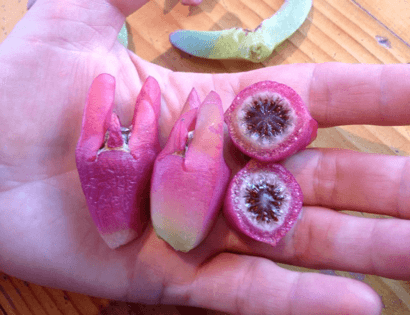 Their identification to species is often vague and unclear.1 See Appendix for glossary of Noongar terms for the Carpobrotus and its edible fruit. Plate 1: The bright pink-purplish flowers of the native coastal pigface. Photo by Barb Dobson (Sept 2018). 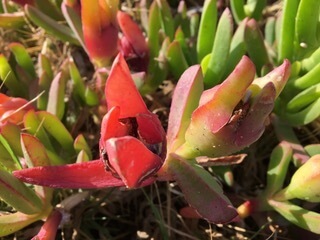 Carpobrotus is a summer fruit which in its ripened state contains numerous small dark brown seeds surrounded by a white pulpy mixture with a sticky consistency (see Plates 3 and 9-13). The fruit can be easily peeled or squeezed out from the base using one’s fingers. 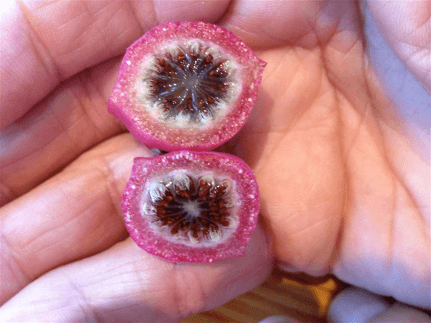 It is highly palatable and has a juicy and mucilaginous texture, tasting something between a strawberry and a fig with a slight salty aftertaste. In the traditional Noongar diet it provided a source of moisture, salt and plant sugars or carbohydrate and helped to stave off thirst and prevent dehydration. It acted similarly to modern day electrolytes – replenishing the body’s essential salts. 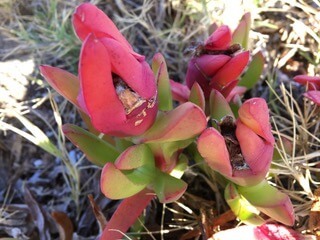 ‘several species of Mesembryanthemum which bear esculent fruits, but, like Cape Hottentot Figs, which we have naturalised about Clarence, and elsewhere, they are generally shy bearers and when the fruit is produced it is so enveloped with fleshy leaves, full of saline juice, that the flavour is generally spoiled in eating. 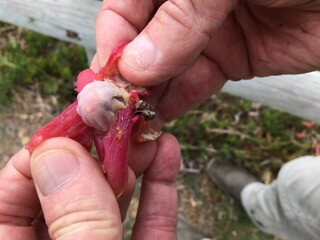 When out last summer, collecting seeds on the bank of the Salt River, about 20 miles east of Toodyay, I found a species of Mesembryanthemum covered with yellow fruit about the size of a goose-berry, and I think it little inferior, as a fruit, to the English goose-berry. I was in want of water and ate freely of the fruit, and I think it is well worthy of being introduced and cultivated in our gardens. ‘(Letter No. 3 to the Enquirer, 13th July 1842). ‘Johnny Coolbungs, like a wild fig growing in the ground, in the face of the ground, we used to eat them, we used to love them. I’d eat them now if I saw them around.’ (Bropho 1980:9). Plate 3: Kolbogo – the pulpy fruit of the native Carpobrotus virescens. Photo by Ken Macintyre. Plate 4: The flowers of Carpobrotus growing in the coastal belt at Swanbourne. Photo by Barb Dobson. Plate 5: Fruiting in summer the kolbogo was a thirst-quenching snack food. Photo by Ken Macintyre. Plate 6: The fruit commonly known as kolbogo is also known, according to a former fringe camp dweller at Swanbourne, as “Johnny Coolbung.” The fruit base becomes swollen after flowering and develops into an edible fleshy fruit. Photo by Ken Macintyre. Plate 7: Patches of fruiting Carpobrotus. January. Photo by Ken Macintyre. Plate 8: Kolbogo fruit. Photo by Ken Macintyre. Plate 9: Kolbogo or “Johnny coolbung.” Photo by Barb Dobson. Plate 10: Kolbogo. Photo by Barb Dobson. Plate 11: Kolbogo. Photo by Barb Dobson. Plate 12: Kolbogo. Photo by Ken Macintyre. 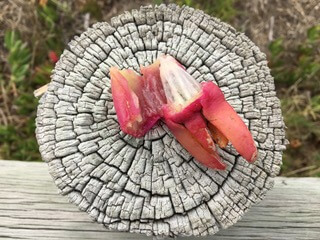 Plate 13: A cross section of the native Carpobrotus fruit (kolbogo) showing the dark seeds enveloped in white pulpy flesh. Photo by Ken Macintyre. There are numerous references to the early white settlers boiling the leaves and using them as a green vegetable and a source of vitamin C to prevent scurvy. They also made jam from the fruit – an innovation that was readily adopted by some Noongar families who found that by mixing native fruit, sugar and water made a tasty jam. 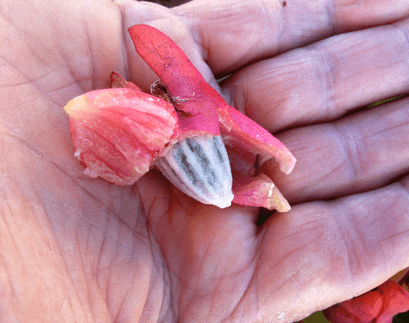 Quandong jam is another example of the indigenisation of a colonial food preparation. 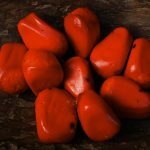 The ripe pulpy fruit was also used as a bush medicine to treat chronic diarrhoea by helping to restore fluid balance and nutrients. 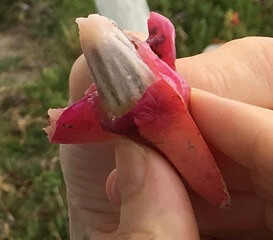 A senior female Noongar Elder pointed out while on a field trip with us at Alkimos, north of Perth, discussing “bush medicine” that the saline juice of the leaves of Carpobrotus was believed to be a traditional antiseptic and possessed a mild anaesthetic quality. She likened its soothing effects to aloe vera. The plant’s leaves in a crushed form were used traditionally as a poultice to relieve mild burns, skin irritations and insect bites. 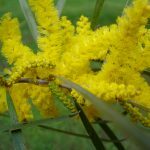 She said that sometimes a fine white wood ash from the Banksia was added to the gelatinous poultice to give it a soothing paste-like quality. She stated that it was more effective than calamine lotion. There has been considerable scientific research into the beneficial effects of the leaf extract of Carpobrotus rossii which is native to Western Australia, South Australia, Victoria and Tasmania. 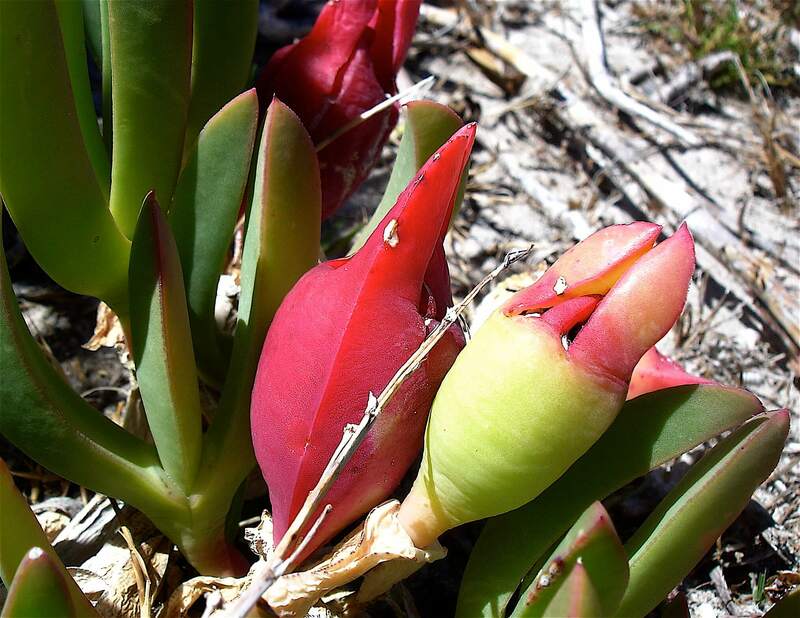 This species, according to Florabase, is found in the Carnarvon/ Shark Bay area. ‘This scientific information can serve as an important platform for the development of inexpensive, safe and effective natural anti-infective medicines.’ (Springfield et al 2003). Flavonoids have been associated with a range of pharmacological activities (Hostettman et al.,1995), modulation of immune cell function, hepatoprotection, anticarcinogenicity and antiviral activity (Middleton and Kandaswami, 1993).’ (Springfield and Weitz 2006: 1292). To our knowledge there have been no scientific studies carried out on the chemical and pharmacologically therapeutic properties of our own local native coastal and inland species of Carpobrotus found in southwestern Australia. These are C. virescens (coasal) and C. pulchella ms (coastal) and C. modestus (inland pigface). Noongar people have been aware for thousands of years of the medicinal and nutritional qualities of this plant. However, it is only now that we are starting to acknowledge the natural therapeutic benefits that this plant may provide. 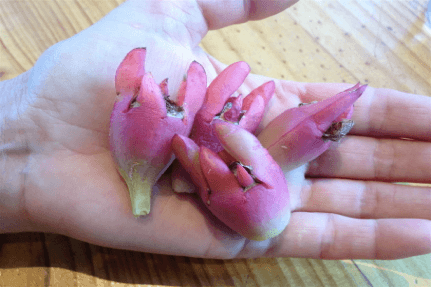 With respect to our anecdotal references to the medicinal qualities of the fruit and leaves of Carpobrotus in Noongar culture, we would caution their usage without consultation with an experienced indigenous practitioner. 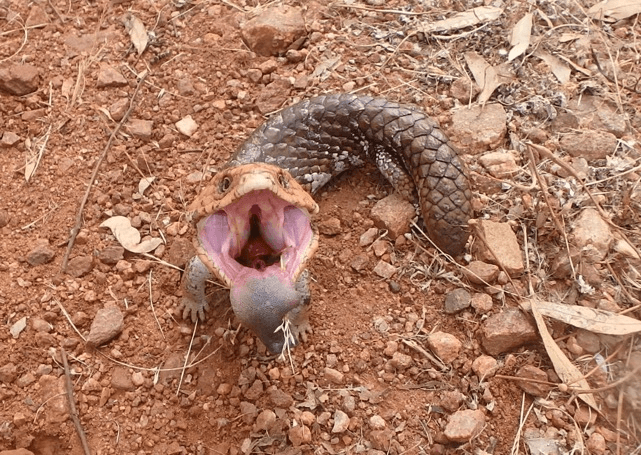 The yorna or “bobtail lizard” (Tiliqua rugosa) attracted to Carpobrotus fruit in inland and coastal areas. Photo by Ken Macintyre. I. Grey records kolbogo (1840: 65) and majeruk (1840: 77) as the Noongar names for ‘the Hottentot fig’ in southwestern Australia. Majeruk is also rendered in the ethnohistorical sources as majerak, metjarak and mejarak (see Appendix for a glossary of Noongar terms ). 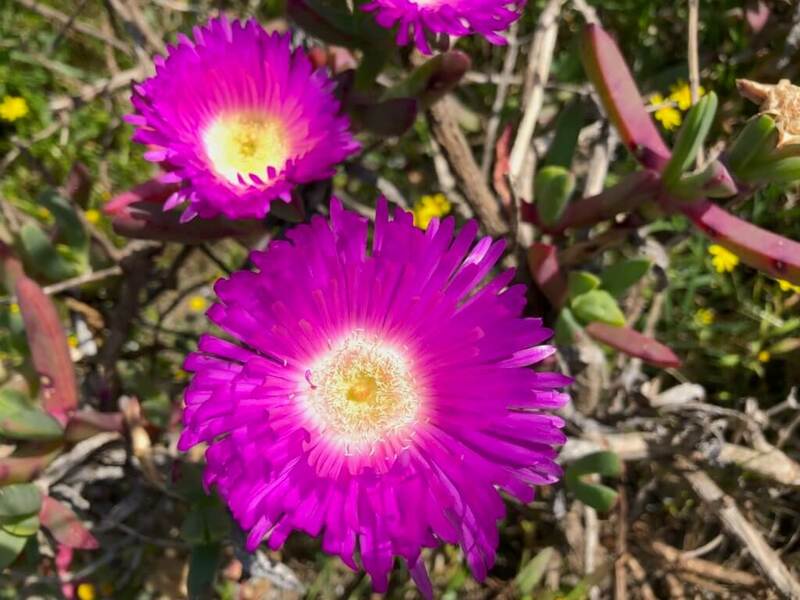 There is an attempt by Moore (1842: 42, 53) to identify kolbogo and metjarak to a particular species – Mesembryanthemum equilateralis or what he calls ‘the Hottentot fig-plant.’ This species’ name, according to botanical sources, is synonymous with Carpobrotus aequilaterus, which refers to a widely naturalised species of “angular pigface” found throughout coastal southwestern Australia where it is considered an invasive weed originating from South Africa (also South America, hence its name “Chilean fig”). It is impossible to ascertain whether Moore is in fact referring to the introduced species or the native Carpobrotus. The Noongar would have eaten all species which had edible fruit, native and naturalised. As highlighted in our other papers, the European-derived Linnaean speciation model had little if any relevance to a traditional Aboriginal hunter-gatherer-cultivator economy which had evolved over many thousands of years its own practical and utilitarian survival-based taxonomy and nomenclature systems. Bropho, R. 1980 Fringedweller. Sydney: Alternative Publishing Cooperative. Drummond J. 1842 Letter No. 3 to the Inquirer, 13th July. Geraghty,D.P., Ahuja,K.D., Pittaway,J., Shing,C., Jacobson, G.A., Jager,N., Jurkovic,S., Narkowicz,C., Saunders,C.I., Ball, M., Pinkard, A., Vennavaram, R.R., and M.J. Adams 2011 ‘In vitro antioxidant, antiplatelet and anti-inflammatory activity of Carpobrotus rossii (pigface)’ Journal of Ethnopharmacology, March 8, 134 (1): 97-103. Epub 2010. Abstract. Grey, G., 1840 A Vocabulary of the Dialects of South Western Australia. London: T. and W. Boone. 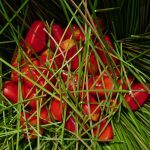 Low, Tim 1989 Bush Tucker: Australia’s Wild Food Harvest. Pymble, New South Wales: Angus & Robertson. Low, Tim 1990 Bush Medicine: A Pharmacopoeia of Natural Remedies. North Ryde: Angus and Robertson. Lyon, R.M. 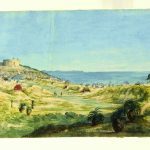 1833 ‘A Glance at the Manners, and Language of the Aboriginal Inhabitants of Western Australia; with a short vocabulary’. In N. Green (Ed.) Nyungar – The People: Aboriginal customs in the southwest of Australia. Perth: Creative Research Publishers. Marchant, N.G. ; Wheeler, J.R.; Rye, B.L. Bennett, E.M.; Lander N.S. and T.D. Macfarlane 1987 Flora of the Perth Region. Part One. Moore, G.F., 1842 A Descriptive Vocabulary of the Language in Common Use Amongst the Aborigines of Western Australia. London: W.S. Orr and Co. Hard copy. Omoruyi, B.E. 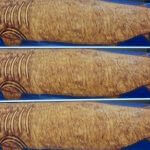 ; Bradley, G. and A. J. Afolayan 2012 Journal of Medicinal Plants Research Vol. 6 (19), pp. 3603-3608, 23rd May. Symmons, Charles 1841 Grammatical Introduction to the study of the Aboriginal languages of Western Australia. Perth: Western Australian Almanack. ‘kolbogo – Mesembryanthemum equilateralis; the Hottentot fig-plant. The inner part of the fruit is eaten by the natives. It has a salt sweetish taste.’ (Moore 1842: 43). 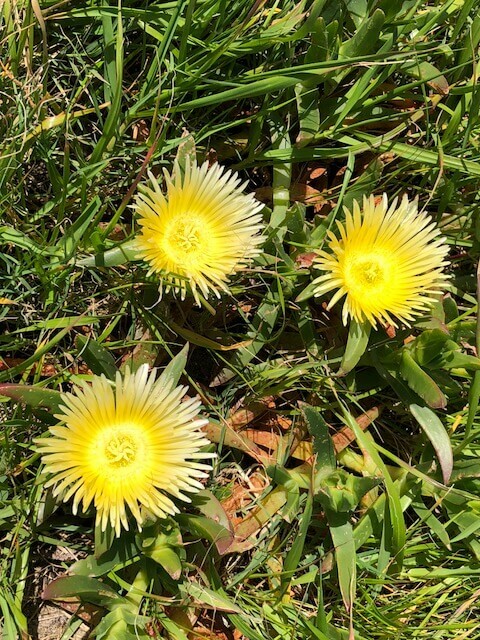 ‘majerak – The small Hottentot fig. (Mountain dialect). The fruit is eaten by the natives.’ (Moore 1842: 48). manbibi – ‘the small Hottentot fig.’ (Symmons 1841: vii; and Moore 1842: 49).